Wherever there is an addicted individual, there is always someone or more than one person participating in the very affliction or addiction that that family member has. We will see this predominantly when we take a look at marriage. Al-Anon was introduced almost immediately upon the historical beginning of Alcoholics Anonymous because the spouses of alcoholics and addicts recognized that in their own way, they had been deeply affected by alcoholism or the addiction of the person they were in relationship to. There is an entire school which is called “family systems theory” which talks about the fact that families are interconnected and there is no one individual that is on their own. They have a strong emphasis on considering that everyone has a part in the treatment of any known illness. The Orthodox perspective is to consider that that the Lord himself is in deep relationship. The Father is one with the Son, and the Son is one with the Holy Spirit, and they together are one in essence—three different Persons, but one in essence. And they are in relationship with each other. Our whole life needs to include experiencing our relationship with him and being freed from the bondages of sin in order for us to experience the love of God, which is expressed in the blessed Trinity. That’s the basis of a true validity when those traditional therapists talk about family systems and how we’re interconnected. We are interconnected because God himself is interconnected, and he created us this way. 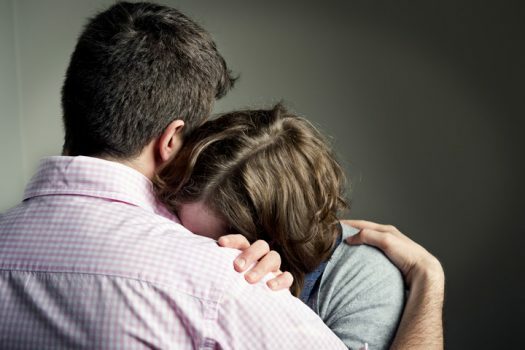 What is the solution to the person who’s afflicted equally when they are in relationship to an addicted spouse? The solution is to focus on their own emotional and spiritual growth. They’re powerless over the effects of alcoholism more than anything else, but they take the same steps. The step reads, “We admitted we were powerless over alcohol, and alcoholism, and all of the ways that everyone has been affected.” Their priority begins to shift from giving up on trying to control the alcoholic and the solution is to focus on oneself and to learn those ways in which we have possibly not learned to set proper boundaries in relationship. Ultimately the program talks about detaching with love. From the Orthodox perspective this is an impossible task. The solution is to trust God, for he and only he can heal the alcoholic and the addict. And we also, those that are in relationship, must avail ourselves of Him and Him alone to a certain degree for being healed of the way in which we often, without even knowing it, are participating in the problem: by minimizing the consequences of the alcoholic’s actions, by denying the exact nature of the irresponsibility and actions of the addict. That person in relationship needs to avail themselves equally of the Lord God for their own healing. That person in relationship to the addict, is often enabling the problem because they themselves have not learned to trust God. Only the Lord can be the one that is truly the power greater than ourselves that the program speaks about. When one person or two turn from their sins and live an exemplary life and seek righteousness and holiness, God is at work and is able to reverse years of slavery and the addictions and the patterns of sin. We see how a marriage that can avail themselves of the Lord can bring forth fruit, and its effect can go on for generations upon those that come after them and upon the entire body of Christ and the whole Church.This takes a level of humility and obedience, and it will include a relationship with a spiritual father. From the 12-step recovery program, we’ve got to go beyond technical sobriety, and not just have a level of physical sobriety. But we have to recognize that the Orthodox Church calls us, almost to a certain degree, to a higher level of freedom and healing than the program, because it will point to the removal of sin, first and foremost, in our lives.